Ok when I first got the bike I bought V-Trec levers. Hi, I got the same levers from ABM as I wasn't happy with the levers from MG-Biketec. They eventually found out that they made a mistake at designing so I got my money back. Haven't fitted the ABM levers yet, next week I have the 1000 km service and I will let the serviceman fit these levers. Seems like far to much hassle to me! Just get the HP levers and be done with it! Would love to. But the clutch lever doesn't get nearer to the handlebar. Ordered the HP levers and before fitting it on we discovered that it won't help me. So I searched for an alternative. My V-TREC shorties fit, and work, absolutely fine. I thought they were a 'no-no' cruise control & quick shifter ? Fit perfectly, and everything (cruise control and QS) works fine. There have been some issues with the longer V-TREC levers, but the shortys fit ok and look great. I have shorties on my XChallenge so that suits me. Hi,I have just looked on Bikemart to buy some levers for my 2016 XR after watching the Video. 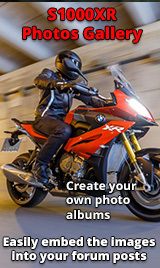 I can only find listing for s1000r ? Are these the ones you fitted and if so will the factory handguard still fit over them. Thanks for any help with this matter.